It’s a familiar scene: a large stadium-style lecture hall equipped with hundreds of students staring down at a professor who switches through PowerPoint slides on an oversized projector. As everyone settles into their seats, the laptops begin to open. While many students will go directly to a document in an attempt to take notes (unless the professor is some sort of circus performer), it doesn’t take long before minds — and cursors — begin to drift. Despite even the most diligent student’s best efforts, the initial motivation to take notes fades as screens in every direction become infiltrated with the Internet distractions that have redefined procrastination — Facebook, Twitter, Pinterest, StumbleUpon and the works. 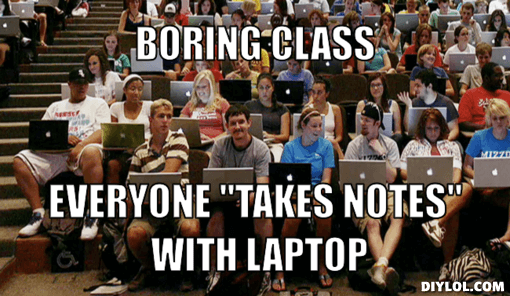 So, are laptops the mortal enemy to the current college generation’s ability to pay attention in class? Let’s hope not, because they don’t seem to be going anywhere. Even as professors try to enforce anti-technology rules, SmartPhones have made it extra difficult to stay completely offline during class. Some students, however, are still showing enough discipline to remain unplugged during class, proving that the reward of using classic methods of note taking can outweigh the temptation to self-distract. For many students, the desire to use a laptop in class can be amplified by the ease of typing versus writing notes out by hand. “Even though it takes longer to handwrite all of my notes, I know I will process the information more effectively than if I were to type them,” Leckenby said. For Leckenby, even the absorption of knowledge by handwriting is just enough to resist the urge to plant herself in front of a screen.